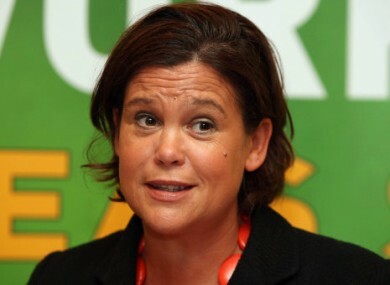 Mary Lou McDonald says French and Greek elections show people are signalling that austerity is not working. SINN FÉIN HAS CALLED the French and Greek election results a “massive blow” to austerity policies in Europe. “People are sending a clear signal that austerity is not working and that a new approach based on jobs and growth must be found,” TD Mary Lou McDonald said today. The Sinn Féin TD also accused Tánaiste Eamon Gilmore of making ‘cynical claims’ that the Irish government shares the same growth agenda as the French president-elect. In his campaign, Francois Hollande had pledged to rework the Fiscal Compact treaty. While congratulating Hollande on his success over Nicolas Sarkozy in the French presidential election this weekend, Gilmore said that Hollande’s win would have no bearing on holding an Irish referendum on the European Fiscal Compact treaty at the end of this month. German Chancellor Angela Merkel told the press today that she was looking forward to working with Hollande, but ruled out any further renegotiation of the treaty. Email “Election results a 'massive blow' to austerity, says Sinn Féin”. Feedback on “Election results a 'massive blow' to austerity, says Sinn Féin”.